Just how high is the developmental ceiling for Chiefs’ Patrick Mahomes? Judging by his play to date this season, Mahomes is showcasing results reminiscent of a potential future Hall of Fame enshrinement. While it would be best to hold back that expectation, Mahomes is certainly not taking his foot off of the gas. Whether gifted with a clean pocket, scrambling to find open receivers or using his legs to accumulate yardage, Mahomes has shown an elite ability to punt points on the board at a record-setting pace. Multiple strikes between he and wide receiver Tyreek Hill (37 and 14 yards) found the end zone that individually matched their opponent’s offensive output the entire game. Speaking of talented Chiefs, running back Kareem Hunt put several impressive abilities of his own on tape. Taking snaps out wide, Hunt hooked up with Mahomes on a slant for a first down in the coverage of Bene’ Benwikere that circled the difficulty defending the second-year back. While his number wasn’t called on the red-zone carry that netted Spencer Ware a touchdown, Hunt will continue to accumulate impressive numbers within this offense utilizing his skill set. Chris Jones the run defender didn’t have a great day, as he lost ground on several occasions and didn’t make much of an impact. But he more than made up for it as a pass-rusher. Jones had two sacks, repeatedly collapsed the pocket against the interior of the Arizona offensive line, especially in the second half, and also batted two passes down. Dee Ford continues to play at the highest level of his career this season. He picked up another sack, had several other disruptions and caused at least two holding penalties against Andre Smith. On the other side, Justin Houston had a pretty good day to match. While he didn’t get a sack, he did cause a few pressures and picked off a low-thrown screen pass. How do you stop the KC offense? A very simple answer to was put forth by edge rusher Chandler Jones: Apply immediate pressure on their all-world signal-caller. Jones defeated Eric Fisher for a pair of sacks to halt the respective drives prior to halftime. Jones also made a couple key plays in run defense to walk away from the loss with an impressive showing. Unsurprisingly, the Chiefs chose to avoid targeting receivers within the coverage of Patrick Peterson and had minimal success when they did. Mahomes and Co. wound up attacking the coverage of Benwikere and safety Tre Boston. Boston found himself responsible for the first touchdown pass to Hill, and Benwikere allowed multiple receptions on his way to collecting eight combined tackles. Arizona has had one of the worst offensive lines this season, and that continued into Sunday’s game against the Chiefs. While they did get good movement at times in the run game, they wholly struggled in pass protection. Smith was beaten by Ford repeatedly, even causing a few holding penalties, and Jeremy Vujnovich–starting in place of Mike Iupati–was pushed back into the quarterback multiple times. David Johnson set season-highs in rushing (89) and receiving (85) yards on 27 total touches. He also found the end zone twice, just his second game with multiple touchdowns this year. He scored multiple touchdowns in half of his games in 2016, for comparison. 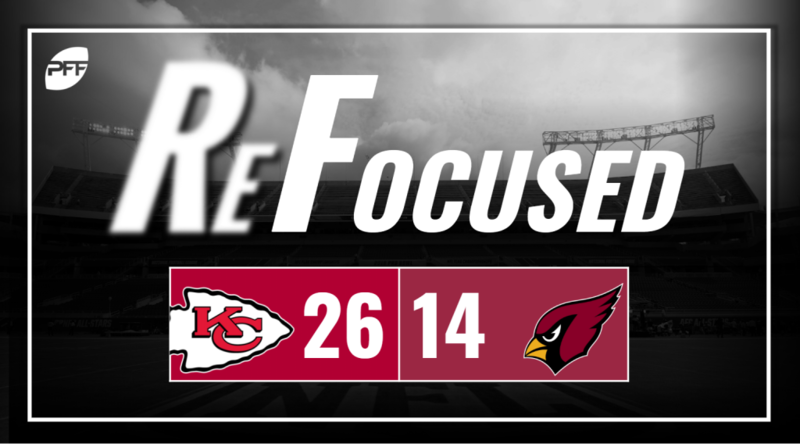 Even facing an above-average passing defense, the Chiefs overcame its weak points for more than enough offense to come away with the victory. Arizona ran the ball better than they have recently, but their offense overall continues to struggle, and the offensive line isn’t making things any easier on Rosen.